My first book by Adam Nevill was Last Days which I read last year. Since then I have been on the lookout for his books but they are not in the mainstream bookstores. The only stores of which stocked Adam's title, so far, from what I can see, is Kinokuniya in KLCC. And for course, the state library of which was my initial introduction to Adam Nevill's titles. 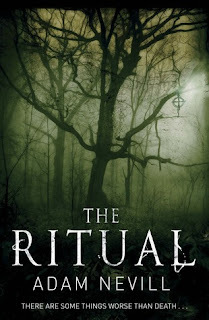 When I was there a few weeks back, I can't help to to see if there's any and yes, The Ritual was the only title there at that time so even though I have a lot of other TBR titles at home, I just have to have this one. The Ritual is creeeeeepy. It is horrifying and it's thrilling. The image cover itself is already extremely creepy. From the first chapter right up to the last, it's not a book to be read while at home alone thus you might scared yourself silly but that's what I did and scared myself silly I did too! There's a section in the middle of the book that was a bit out of syn, like the author was a bit at lost on how to progress on with the story but after a while, I think he managed to bring everything back together and tie everything together rather well. I can't wait until I get my hands on anther title by Adam Nevill.